Christie Golden let everyone know that there is lots of art in these books! Blizzard released a preview of the Collector's Edition Novellas, one for the Alliance and one for the Horde. There are two sides to every story. Get a taste for the tension and drama that unfolds in this preview of our Battle for Azeroth novellas: Elegy by Christie Golden and A Good War by Robert Brooks. These two tales explore the Horde and the Alliance versions of a fateful event, but only you can decide which faction tells it best. The full versions of both novellas are available in one beautiful hardback edition, complete with original and exclusive artwork, in the Collector’s Edition of World of Warcraft: Battle for Azeroth—available for pre-order at your local retailer now. The Sentinels stopped, their weariness fleeing in the face of true peril to their people, listening with their whole bodies as Delaryn spoke. Ferryn let out a throaty, furious snarl, but it came too late. Feeling Ferryn tense, Delaryn leaped off him, but a Forsaken had already dropped down from an overhanging branch. He landed directly on Anaris’s back, stabbing with his twin blades as she fell. Swifter than a dead thing ought to be able to move, the assassin rolled to his feet. One of his daggers made a clean, swift strike across Marua’s throat, almost severing her head from her body. With a yowl of fury, Ferryn sprang toward the Forsaken, while—too slowly—Delaryn drew an arrow and nocked it to her bow. There was a blur, and then another rogue was there, a blood elf, slashing out with his own blades, long golden hair flying behind him like a cloak. In what seemed like the span of a single heartbeat, half a dozen night elves were left bleeding out or spasming in torment on the verdant forest floor. Finally, the Sentinels rallied. 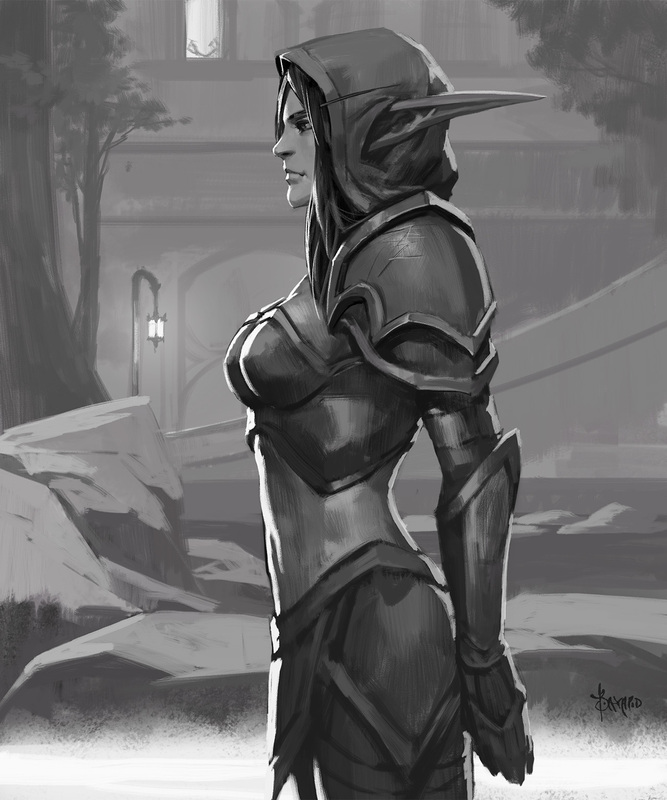 The blood elf vanished at once, but no matter. They would catch him as he fled like the coward he was. They sent a rain of arrows toward the gaps in the trees, but hit nothing. The sin’dorei had eluded them. The Forsaken was not so lucky. Eriadnar surged toward him, drawing her sword. She sliced a furrow across the killer’s torso and lopped off one of his arms. Ferryn pounced, pinning him to the ground, exercising remarkable restraint in not tearing out his throat. Anaris Windwood lay on the forest floor, her eyes open but their glow extinguished. “Commander?” Eriadnar said. “She is dead,” Delaryn replied harshly; she was still furious with Windwood, though the commander was far beyond her anger now. So she was. How strange it sounded. Delaryn shook herself and moved toward the prisoner. Her eyes fell on the daggers he had dropped, covered with Anaris’s blood. She picked one up carefully, then nodded to Ferryn. He stepped back, growling menacingly at the Forsaken. When he didn’t reply, she knelt, grabbed his hand by the wrist, and brought his blade close. So the blade is poisoned. Even though he is dying, he does not want that level of pain. Dead lips curled back from yellowed teeth. Foul breath struck Delaryn full in the face as he laughed. Her stomach rebelled, but she willed herself not to wince. “What kind of poison did you use?” she asked casually. “I would guess it is a painful one—you Forsaken like those. If you do not tell me something useful soon, I will conclude you are stalling for time and therefore have nothing to tell me.” Her voice was cold. It was true. The night elves harbored a deep respect for life. They did not torture prisoners, nor did they take delight in unnecessary casualties. But they had little use for the abominations that were the Forsaken. Delaryn thought of the druid who had flown to Silverwind Refuge with his message. Some outposts had indeed reported a surprise attack. But there was something in the Forsaken’s words that felt forced. And then the answer presented itself, so blindingly obvious that she felt as though she’d been stabbed in the gut. The night elven fleet was en route to Feralas. “You are clearing a path,” she murmured, horrified. The Forsaken made no answer but laughed again. Delaryn raised the dagger, but the rogue’s laughter turned to a coughing wheeze. Gooey liquid spewed from his throat, and then he lay still. He had cheated her; his wounds had claimed his unlife before she could. Delaryn wasted no energy in frustration at the Forsaken’s final jest or the precious minutes she had spent interrogating him. She’d lost enough time. Ferryn shifted back to his kaldorei form. “I can fly faster than she can run,” he offered. The Sentinel nodded, wide-eyed, and leaped to obey as swiftly as an arrow shot from a bow. He nodded. They looked at one another for a moment. There was no need for words. They had gone into battle countless times before, sometimes together, sometimes on their own. Now, they had been plunged into it yet again. At the same moment, they reached for each other, kissed deeply, and then turned to their duties. Ferryn didn’t know, but whenever the two of them parted, Delaryn prayed to Elune that he would be safe. She asked for that favor again now, and for the first time, she had the faintest fluttering that, in this battle, the beautiful, loving moon goddess might not answer that prayer. The elf’s face contorted, and for a moment, Saurfang believed he was about to cry. But no—with his last breath, the dying rogue spit onto Saurfang’s boots, leaving streaks of blood and saliva across his armor. Then he went still. Saurfang agreed. Such spirit. And I never even learned his name. He strode outside, snarling. There were siege crews, guards, and soldiers all around. Astranaar was swimming with Horde, and not one of them had marked the stranger walking through their midst. Not one had challenged him. He would enjoy explaining that to them in excruciating detail. “Listen well!” he began. Heads turned toward him. Eyes glanced at the blood on his axe and armor. And then he stopped. His next heartbeats seemed to last an eternity. His fatigue-addled mind had finally caught up with his hard-earned survival instincts. That boy had not been sent to kill him. He had been trying to lead Saurfang outside. In his haste to lecture his guards, Saurfang had done exactly what that boy had wanted. You just killed yourself, you old fool. He turned and flung himself back into the inn. An instant later, the ground shook as Malfurion Stormrage landed where he had been standing. “Lok-Narash!” he yelled. To arms! His advisors and tacticians were already forming a line in the common room, pulling him behind it and standing at the ready. Like many night elf buildings, this one had open walls on three sides, giving them a view of the chaos roiling outside. Siege crews scrambled away from Malfurion, only to fall from arrows and blades in their backs. This wasn’t just Malfurion. This was the kaldorei’s last stand in Ashenvale, a decapitation strike on the commander of this battle. And Saurfang—they had drawn him in so easily. Astranaar was an island with limited access. Easily defensible. And Saurfang had just taken shelter in a building with few walls. To fight an archdruid. As the sounds of chaos rose outside, the inn darkened. Malfurion Stormrage stepped through the doorway, eyes fixed on Saurfang. Three of the high overlord’s advisors charged him. Malfurion moved, and the metallic claws strapped to his wrists made short work of the two orcs and the blood elf. He stepped forward, over their bodies. The words sounded bizarre to his own ears. What use did a night elf have for an orcish duel to the death? It didn’t matter. Malfurion was here for Saurfang. He would not pursue a bunch of advisors. Morka looked furious, but she obeyed. She snatched up the map container and sprinted out of the building. The rest quickly followed. Malfurion said nothing. He raised his arms. The inn trembled. The wooden floor and ceiling creaked and groaned. Saurfang’s lips pulled back into a snarl. The power of nature was not found in the swing of a fist or the slice of a blade. It was found when a forest was rent to dust by fire and yet returned in only a few years. It was found when a mighty city was claimed by overgrowth after being abandoned for a decade. It was found in a thousand generations of predator and prey, which lived and hunted by the instincts of their ancestors. In the hands of a druid, that power could be condensed from centuries into a minute. In Malfurion’s hands . . . This inn, and everything in it, would be returned to the earth in seconds. 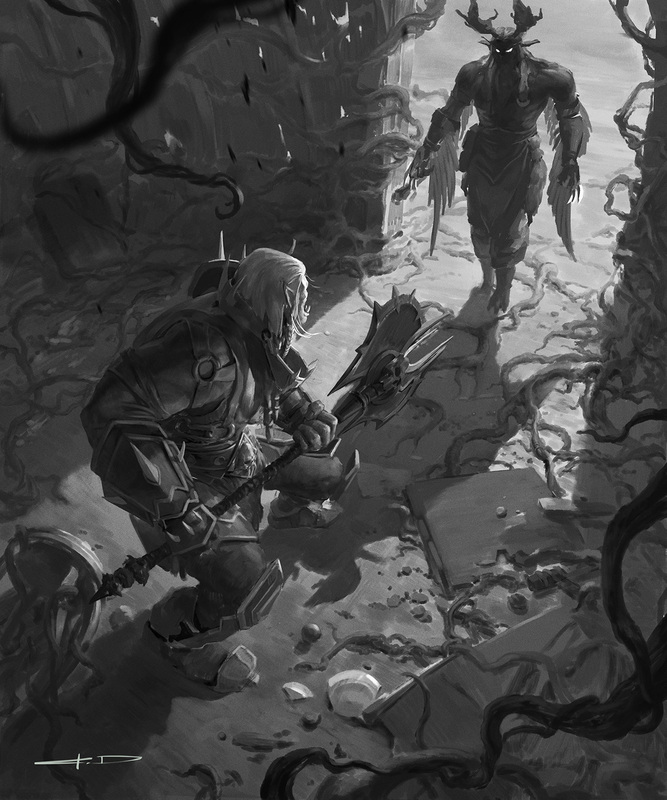 Saurfang leapt forward, axe swinging, as vines and roots tore apart the inn. Malfurion stepped clear of his blow effortlessly, and the metal claws strapped to his hands darted toward Saurfang’s head. The orc batted them away with his axe shaft. Barely. Saurfang roared, his axe whistled, and Malfurion’s second strike snaked between a gap in his armor around the shoulder. Blood dripped to the floor. Roots, countless roots, a whole forest of roots grabbed at Saurfang’s ankles. He danced away, chopping the plants whenever they tried to snare him. When pieces of the inn started to fall around the orc’s head, he accepted his death. Against a creature like Stormrage, there was no dishonor in failure. Saurfang simply had to meet his end without surrender. Saurfang opened his eyes. Malfurion was not looking at him. His arms were crossed in front of his face as an arrow, wreathed in shades of violet smoke, exploded just before him. Emerald light rose against the darkness, and Malfurion charged to fight Sylvanas Windrunner, who had another arrow nocked and drawn at point-blank range. Saurfang would have leapt to his feet, but his legs wouldn’t obey his commands. Then the inn collapsed on top of him, and he was surrounded by darkness and pain. But he wasn’t dead. Not yet. Death wasn’t supposed to hurt this much.